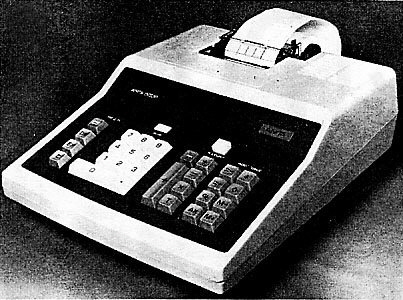 The basic model is the 500P, with the two SFK models adding unique, purchaser-selectable, Special Function Keys. Printed output with 14 columns. These models are based on the ANITA 500P but also have Special Function Keys (SFK). Purchasers can choose four or six (depending on the model) special functions, out of nine available, which are mapped to the Special Function Keys at the top of the keyboard. The brochure lists the special functions available as: DEPRECIATION, MARK UP, LOAN PAYMENT, AMORTIZATION, POWER (for integer exponents), PER CENT CHANGE, MEAN/STANDARD DEVIATION, STORE IN, and STORE OUT. 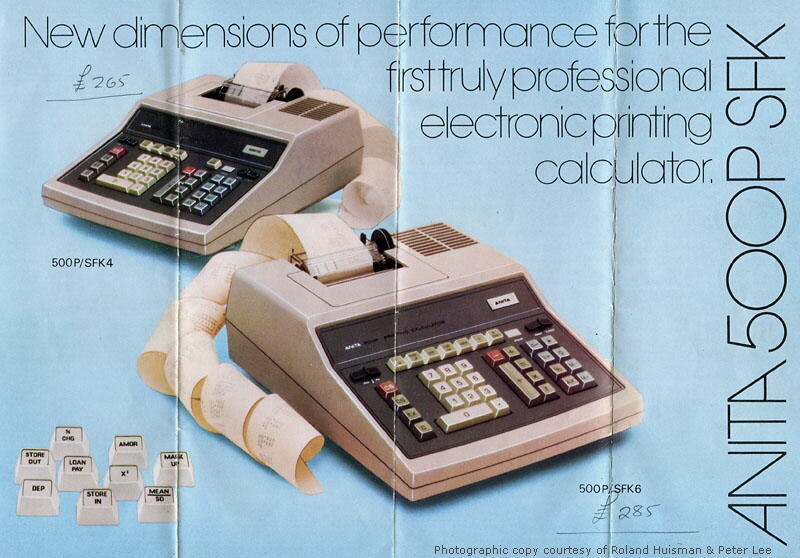 Providing this choice of special functions is unique to these models among calculators of the time. Four-function, memory, and the special functions described above. Cost: 500P/SFK4 £265 GBP [about US$615], 500P/SFK6 £285 GBP [about US$660]. Management in Action, October 1973, p31.